Don’t miss the debut of CUMC’s new Public Health Film Series on Friday, November 9, at 4 pm in Alumni Auditorium. And bring a friend! The first showing will feature episode 1 of HBO’s acclaimed series, The Weight of the Nation. 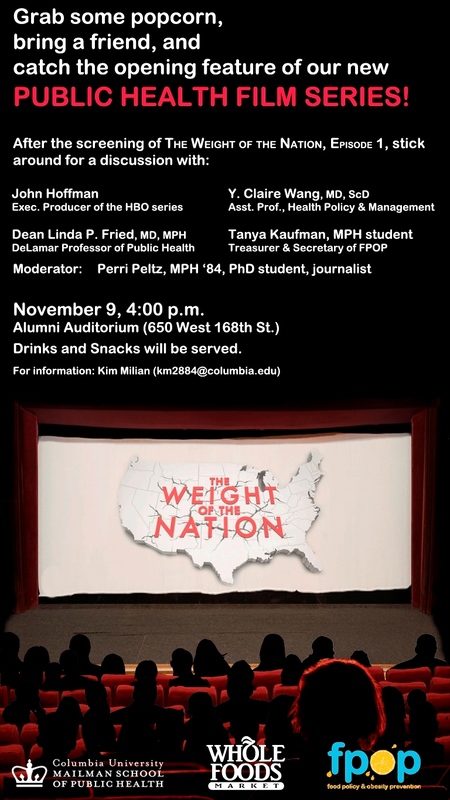 The screening will be followed by a lively discussion with HBO executive producer John Hoffman, Dean Linda Fried, HPM faculty member Claire Wang, and our very own Tanya Kaufman, E-board member of the Students for Food Policy and Obesity Prevention. The host and moderator will be Perri Peltz, journalist, Mailman alum, and current PhD student. Enjoy beverages and snacks after the show! Are you on a special diet for health reasons? Did your friend get caught up in some passing fad diet? On October 17th, FPOP co-sponsored a roundtable discussion with the P&S group “Food for Thought” at which CUMC students joined Dr. Sharon Akabas of The Institute for Human Nutrition to discuss nutrition in special diets and their possible unintended consequences. Whether you have a serious food allergy or have decided to eliminate a food group, like dairy, you may want to become familiar with the potential nutritional deficiencies that go along with your diet. There are plenty of alternative products to meet the needs of most diets, you just need to be a savvy consumer! 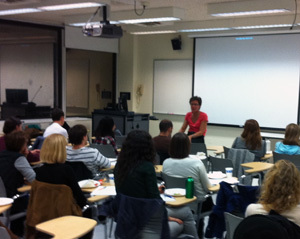 Dr. Akabas busted some food myths with a look at the literature, and shared ideas for the direction of future research. Students came in with questions and concerns and left with both their hunger for knowledge as well as their hunger for a delicious vegetarian meal satisfied! 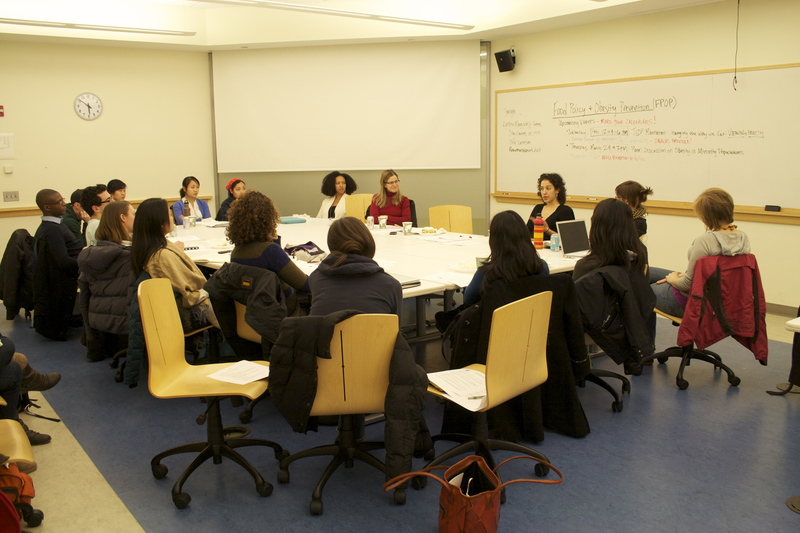 FPOP and other student groups at Columbia came together to plan this major event, gathering experts to discuss the problem of obesity in minority groups in New York City. The forum featured keynote speaker, Manhattan Borough President Scott Stringer, and a panel discussion with Cathy Nonas, Olajide Williams, and Michael Hernandez, moderated by April Velasco. Read more about it here. 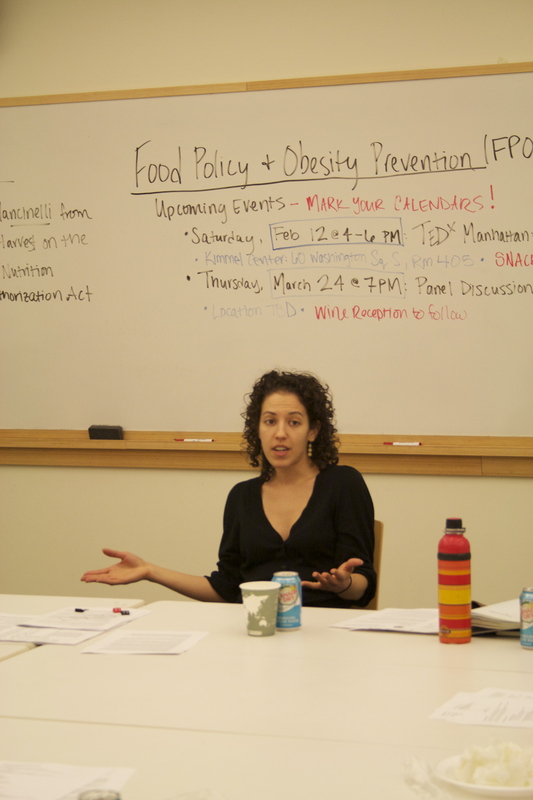 As en expert in food policy and advocacy, Kristen spoke to us about the process of influencing lawmakers to change policy. She shared with us her first-hand experience in building the NYC Alliance for Child Nutrition Reauthorization: gathering stakeholders, priority setting, messaging to public and policymakers, maintaining momentum, and effectively changing legislation. According to the World Health Organization, more than one billion adults worldwide are overweight and nearly 300 million are clinically obese. Obesity is a major contributor to the global burden of chronic disease and disability as a risk factor for type 2 diabetes, cardiovascular disease, hypertension, stroke and certain forms of cancer. Once thought to be a problem affecting only industrialized, developed countries, obesity and obesity-related diseases are increasingly prevalent in the developing world. This conference will convene leading obesity researchers to explore the latest science and policy initiatives for this health crisis both globally and here in the United States. Dr. Claire Wang, M.D., discussed food and beverage taxes in light of her recent research on soda taxes. Dr. Wang focuses on research using mathematical models to integrate epidemiology and demography to inform policy-making in population health.